NORTHÂ VANCOUVER, BC,Â Sept. 1, 2012 – Today, the Squamish and Tsleil-Waututh Nations celebrated their sacred connection to the waters of the Salish Sea with an historic canoe journey starting at SwÃ¡ywi (Ambleside Park) and ending at Whey-Ah-Wichen (Cates Park) where each Nation signed a Declaration to protect the Salish Sea.Â The historic Declaration marks the Nations’ decision to work collaboratively to stop the proposed expansion of Kinder Morgan’s Trans Mountain pipeline and increased oil tanker traffic in the Salish Sea. With the journey, the Nations upheld their responsibility protect and maintain their sacred connection to the waters. Paddlers from other Coastal First Nations joined members of Squamish and Tsleil-Waututh in the journey, and held a sacred water ceremony in front of Kinder Morgan’s Westridge Marine Terminal. 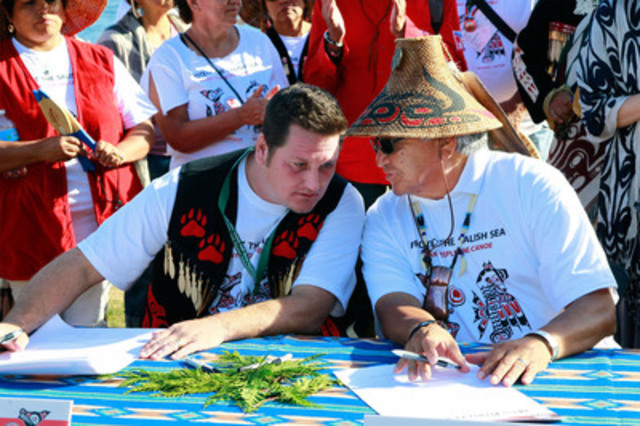 Upon arrival at Whey-Ah-Wichen, Squamish Chief Gibby Jacob and Tsleil-Waututh ChiefÂ Justin GeorgeÂ signed a declaration to protect the Salish Sea. 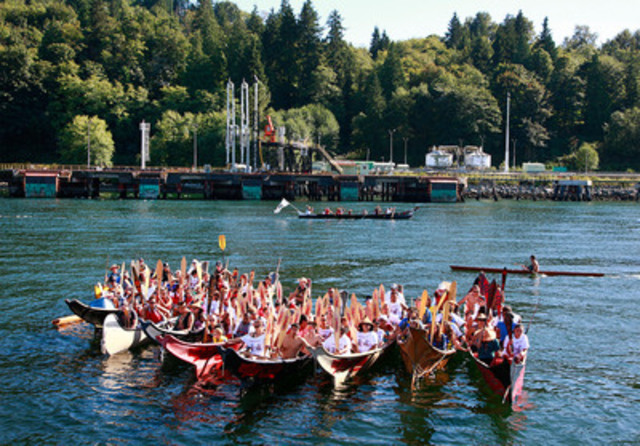 The event celebrated the teachings of the canoe and the unity of all peoples. In attendance were First Nation leaders, elected officials, and members of the general public. Tsleil-Waututh and Squamish Nations have publicly opposed Kinder Morgan’s pipeline project, the terminus of which is on the south shore of Burrard Inlet in Burnaby. The expansion would more than double current pipeline capacity, potentially resulting in one supertanker per day entering the sensitive marine environment of Burrard Inlet. 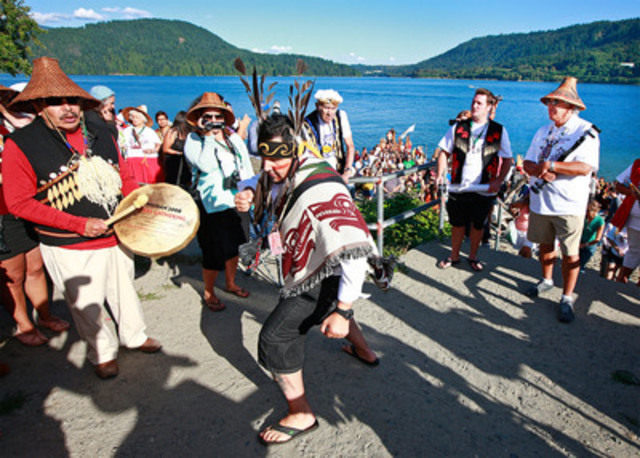 Composed of more than 3600 Members, the Squamish Nation is comprised of descendants of the Coast Salish Aboriginal peoples who lived in the present day greaterÂ VancouverÂ area, Gibson’s landing and the Squamish River watershed.Â Our society is, and always has been, organized and sophisticated, with complex laws and rules governing all forms of social relations, economic rights and relations with other First Nations. We have never ceded or surrendered title to our lands, rights to our resources or the power to make decisions within our territory.Â For more information, please visitÂ www.squamish.net.